Relying on a septic system can be daunting, especially if it is the first time you have ever owned one. You will find that you need to be cautious about what you put down the drain and you have to schedule regular pumping. However, you will soon get the hang of it and it should feel less overwhelming with time. At West Coast Sanitation, we feel it helps to know how to speak the septic language. 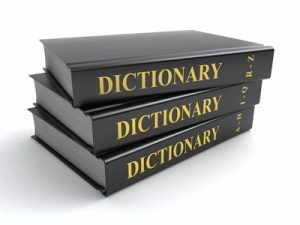 Whether you are a newcomer or a veteran to the septic world, we have compiled a list of vocabulary words to help you better understand your system. Absorption Field: An area in which perforated piping is laid in drain rock-packed trenches, or excavations (seepage beds) for the purpose of distributing the effluent from a wastewater treatment unit. Active System: A septic system that requires external energy and mechanical components to function. Aeration Chamber: A volumetric container made of concrete, fiberglass, steel or plastic. The Aeration Chamber may be fabricated integrally with a septic tank and is designed to house equipment which introduces oxygen (air) into the effluent. Aerobic Bacteria: Odorless, highly efficient strains of sewage digesting bacteria that only exists in the presence of oxygen. They live in the soil around the drain field and are responsible for removing pathogens and other biologic materials coming from the septic tank. Anaerobic Bacteria: Less efficient strains of sewage digesting bacteria that exists in the absence of oxygen. They also live in the soil surrounding the drain field and keep the biomat under control. Bacteria in septic tanks are necessary to break down waste and anaerobic are well suited to the job. Baffle: A t-shaped, tubular device open at the top and bottom having the third leg attached horizontally at the outlet of a septic tank. Typically made of pvc pipe or fiberglass designed to prevent surging and discourage the flow of solids out of the septic tank into the distribution components. Biomat: Slimy greyish layer that forms on the bottom and sides of the trenches in your septic tank drainfield. It is made up of anaerobic bacteria. Black Water: Influent containing human waste. Cesspool (or Cesspit): A pit dug into the ground with the walls loosely lined by stone or brick to allow liquid effluent to seep out of the cesspool into the ground while holding the solids in the pit. Clear Zone: The middle layer of gray or brownish, murky liquid in a septic tank that is mostly comprised of water with small microscopic matter in suspension. Distribution Cell: A narrow trench that contains a perforated piping system embedded and covered in washed gravel in such a manner that effluent can flow into it from a distribution component and be uniformly dispersed into the ground. Distribution Component: Drainfield, seepage pit or mound designed to distribute effluent into the ground. Distribution Field: Another name for absorption field. Distribution Laterals: A distribution component extending from the main distribution pipe to the edges of the distribution field designed to uniformly distribute effluent into the ground. Drainfield: Another name for absorption field. Dry Well: A hollow, porous chamber located underground, constructed using the ground for walls or loosely lined with concrete block, cinder block, or bricks in such a manner that effluent can flow into it from a septic tank and be uniformly dispersed into the surrounding ground. Gray Water: Wastewater which does not contain human waste. Gray water is created from the use of laundry facilities, dishwashers, bathing, or other similar household activities. Leach field: Another name for a distribution field. Passive System: A septic system that does not require external energy and mechanical components to function. Seepage Pit: Another name for dry well. Septic: Putrefactive, rotten, to make rotten. Lacking oxygen. Settling Chamber: A volumetric container made of concrete, fiberglass, steel or plastic, that may be fabricated integrally with a septic tank. The Settling Chamber is designed to substantially slow the flow rate of effluent to provide sufficient time for solids to precipitate out of the liquid effluent. System Failure: A condition when a distribution field becomes saturated and foul-smelling effluent appears on the ground above the distribution component creating a health and environmental hazard. Treatment Chamber: Large volume container made of concrete, fiberglass, steel or plastic designed to hold sewage so that the sewage can be biochemically processed. Vented Cover: A cover made of concrete, fiberglass, steel or plastic that has an integral vent pipe or opening. While these terms are unlikely to impress anyone at a party, they are helpful to understand if you rely on a septic system. At West Coast Sanitation, we know that you don’t have time to deal with septic problems. If you think that your system has reached capacity, please give us a call right away at (951) 780-5922. We have professionals ready to answer your questions and get your system working properly again.